Cakes are almost everyone’s weakness !! 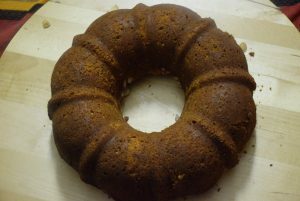 When Halloween is round the corner, and you look for recipes around, here comes a rustic recipe of eggless Indian Mawa cake . 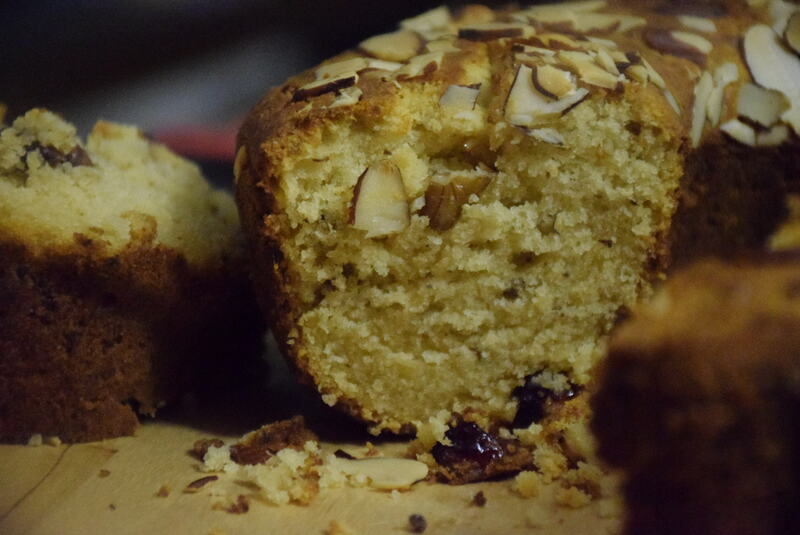 This recipe is inspired from my friend Pranaya, who brought this cake in a recent meetup. But after having her cake, I couldn’t resist but to try it out my way. It came out good, fluffy, soft and Mawik ( 😀 of Mawa). So for those who are doing extensive workouts or tours , this one is an instant filler. Indulge in sweetness this Halloween ! 1. Sieve the dry ingredients viz. 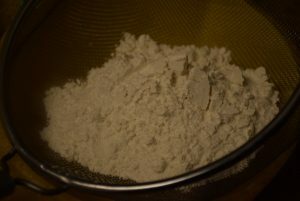 flour, baking soda and baking powder in a bowl through a colander. 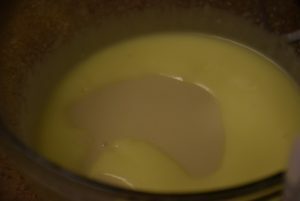 I have added Custard powder only for a bright yellow color it reveals after getting baked. 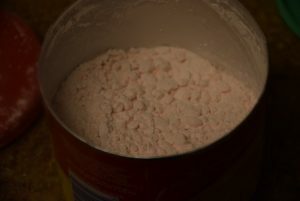 You may skip it completely or may replace it with corn starch or more Maida(all purose flour). 2. 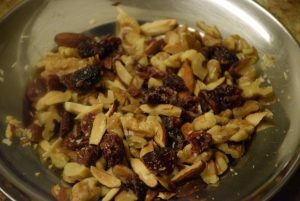 Chop the nuts of your choice in small pieces like walnuts, dry cherries, almonds etc. Also ground some cardamom pods for flavoring. 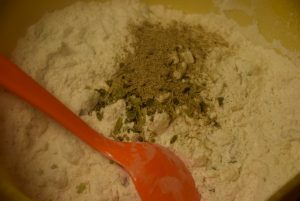 Fresh cardamom imparts an exquisite flavor to any dish.In the dry flour mixture, mix all the chopped nuts evenly. 3. 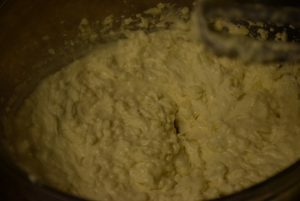 Add Desi ghee and condensed milk in a bowl. 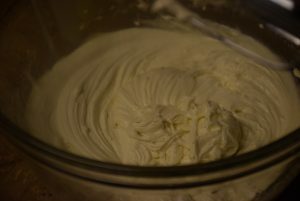 Whisk till it gets creamy. 4. 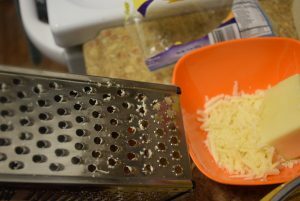 Grate the khoya (milk solids) /mawa using a fine grater. I have used frozen store bought one here. But you may make your own too. 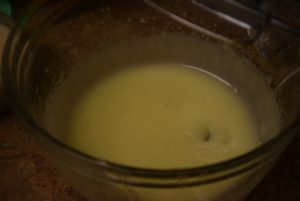 Add the mawa in the above ghee-milk mixture and just mix them lightly. 5. 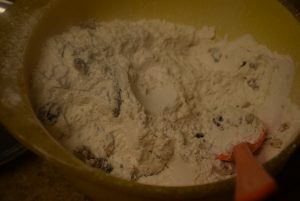 Add the cardamom powder too in the mixture and stir everything. 6. 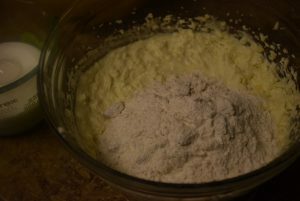 Now add the dry mixture of flour in three part alternating with whole milk such that you get a thick batter consistency like this. 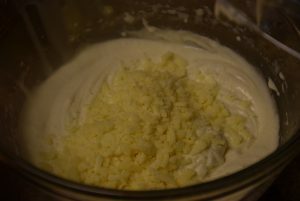 I however, somehow added less than 1 cup milk ,so ended up with a dry cake (little on the dry-side). 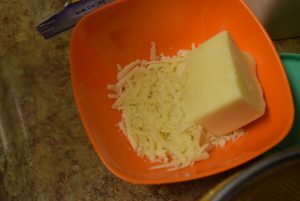 Though it was soft and spongy, but for clean cut slices, the cake should have a little moisture too. 7. 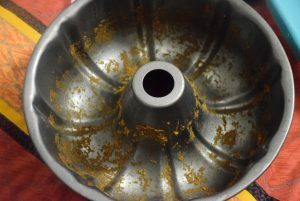 Grease the baking pan with oil or butter well. 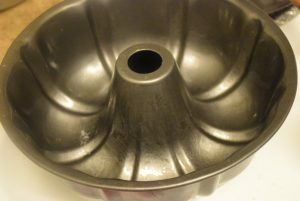 I am using a Bundt cake pan, since this gives an efficient rise in the cake and bakes it faster too. Preheat the oven to 180 degree C or 350 degree F.
8. 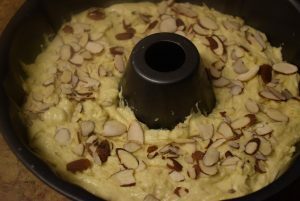 Invert the batter in the bundt pan and tap it 3 to 4 times on the counter. 9. 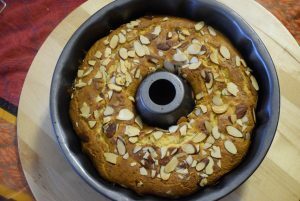 Now add the sliced or silvered almonds on the top for garnishing. You may add cashews too for garnishing. 10. 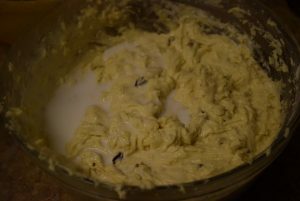 Bake in the oven for 30 to 35 mins. I checked with a tooth-pick after 30 mins and found it moist and sticky after pulling out. 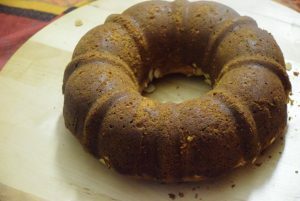 So I pop the cake again in the oven for 10 mins. 12. Let it cool for 20 mins in the pan on a rack at room temperature. 13. 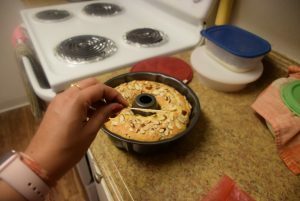 Run a knife all around the cake to losen the edges of the cake before demolding it. 14. Invert it carefully on a cake board or plate. Let it cool further for 10 mins. 15. Now face it up again, cut equal slices with a bread knife and serve. 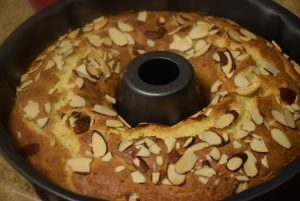 Enjoy this cake hot or warm on a breezy winter day ! 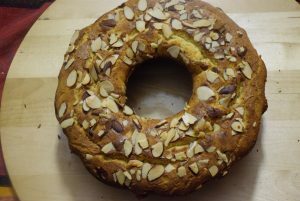 Cut the slices or keep it in an air-tight container for a week and enjoy with your supper in the evening.. I usually warm 2 slices for 20 seconds before serving with tea. 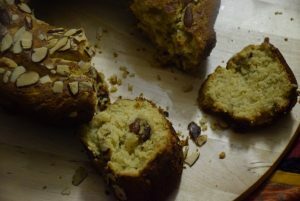 Hope you like this recipe and give it a try ! Looking forward to more possibilities , corrections from you all ! 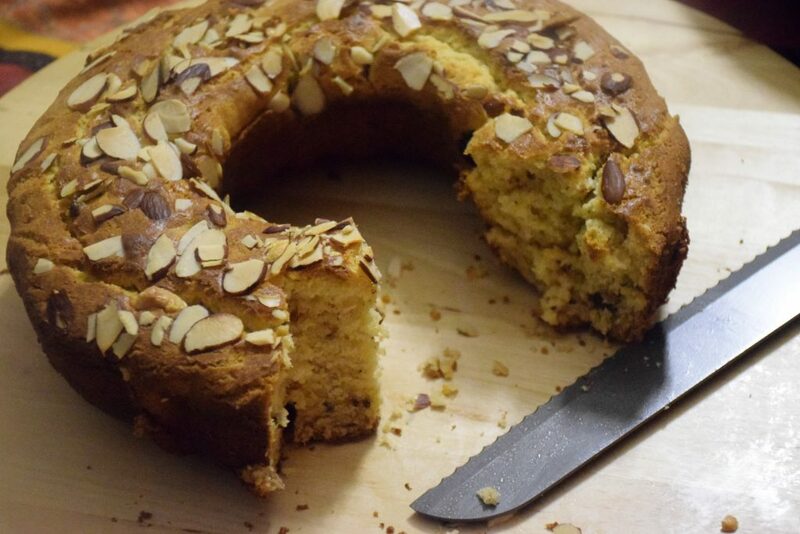 This entry was posted in Appetizers, Desserts, Food, Kids- Favourite, Recipes and tagged 180 C, 2017, 350 F, almonds, badam, baked, basic, beautiful, bundt cake pan, Carenshare, cashews, condensed milk, Craving, custard powder, desi ghee, dry mawa taste, eggless, filling, Halloween special, heavy, infectious craving, Inspired by friend, kaju, khoya, maida, mawa cake, milk solids, Mumbai special, oven, rustic, shweta jindal, soft, store-bought frozen Nanak mawa, tea -time cake, whole milk, zindagisikhati.